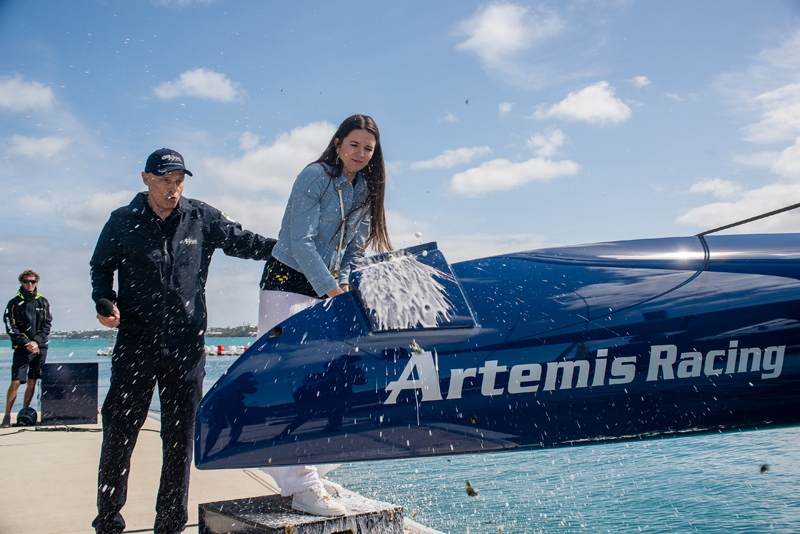 Artemis Racing‘s new race yacht, “Magic Blue”, was christened today by Torbjörn Törnqvist’s wife, Natalia, at a special celebration in Bermuda. 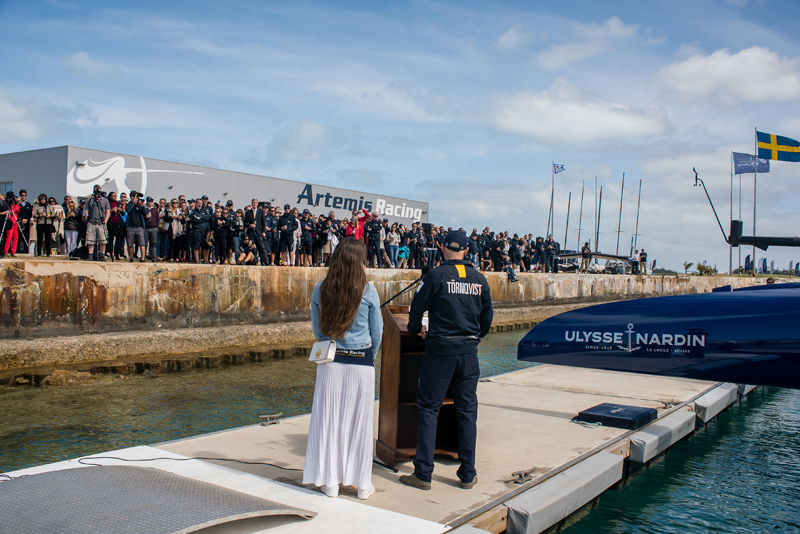 The launch sees the culmination of more than three years of intense design and development work, which began almost immediately after the finish of the 34th America’s Cup in San Francisco. The new America’s Cup Class [ACC] yacht, which measures at 15m [or 49.2ft], is a development from the AC72s raced in San Francisco, retaining the wing sail and hydrofoils, which enable them to fly over the water at incredible speeds. The design differences, or areas left for the teams to explore and innovate in the new Class, lie in the design of the appendages [foils and rudders], aerodynamics, and the onboard hydraulic and electronic control systems. The hydraulic systems are required to be completely powered by human effort and combine traditional sailboat engineering with aerospace technology. 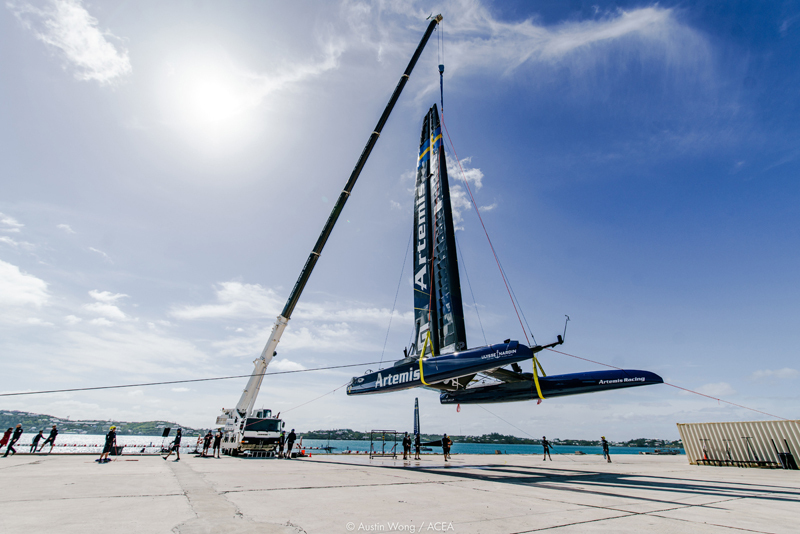 Artemis Racing is thankful for support from a number of technical partners including Altair and Tactair. The change of venue to Bermuda brings a host of new challenges with the varied, shifty conditions. The boats are flying and maneuvering better than ever before thanks to several years of additional development time along with supporting rules changes. This summer’s event is expected to be the most competitive and exciting America’s Cup in recent history. 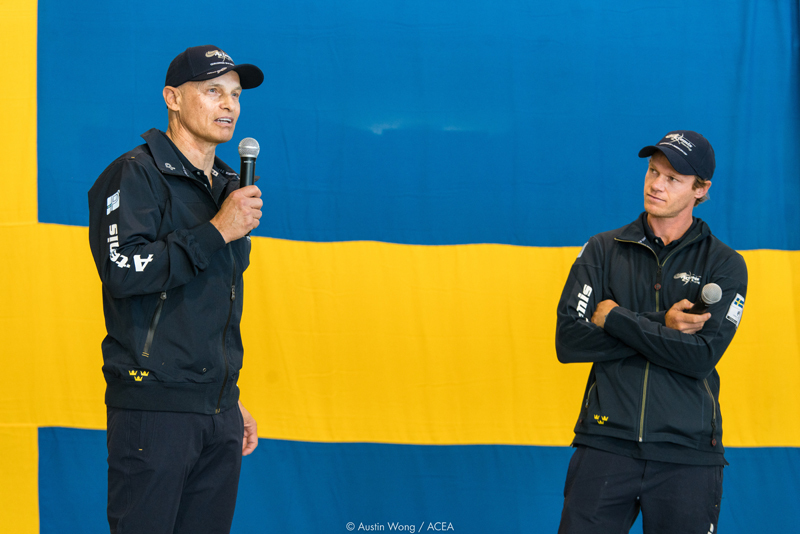 The construction of Artemis Racing’s ACC began in January 2016 at Sune Carlsson Båtvarv, next to the team’s yacht club KSSS, in Saltsjöbaden, Sweden. The hulls were then flown to the US, and delivered to the team’s build facility in Alameda, CA, where the pod, beam and end plate were installed. It was then shipped to Bermuda, where it was reassembled and the final installation of the hydraulics and electronics took place. Mark Allanson, Build Manager, commented, “With over 80,000 man hours in Design and Build it is fantastic to see our boat finally touch the water. “Many parts of our new race yacht have already travelled thousands of miles globally; from the construction of our hulls in Sweden, led by Brandon Linton; to pre assembly at our Base in Alameda, California; and onto Bermuda for systems fit out. The launch was attended by Team Principal, Torbjörn Törnqvist, and Bermudian dignitaries including Premier Michael Dunkley. Torbjörn Törnqvist, Team Principal, said, “It’s a great day of course, very exciting to see the result of so many years of hard work in design, engineering and construction; finally here. It feels good, and the boat looks fabulous. Although the launch marks a major milestone, the team is fully aware that in order to be victorious in June, it must continue to develop and refine its ACC right up until the final race. Skipper, Nathan Outteridge, commented, “This day has been a long time coming, and I am so excited to see the boat in the water. Over the last 3 years we have spent countless hours on the water with our test boats, developing foils and control systems that we believe will win us the America’s Cup. “I have been watching this boat slowly come together here in Bermuda over the last few months, and It’s incredibly exciting to see this beautiful machine complete. “I really would like to thank the design, engineering, build and shore team for their hard work in delivering the boat to us in race ready condition. It really has been a massive effort by the whole team and it’s now up to the sailing team to get out on the water and see what this incredible boat is capable of. On the same day, Artemis Racing took the opportunity to announce a partnership with MARTINI®, a leader in Italian vermouth and sparkling wine with a long heritage in the world of racing, as an official Local Supplier and hospitality provider of the team. 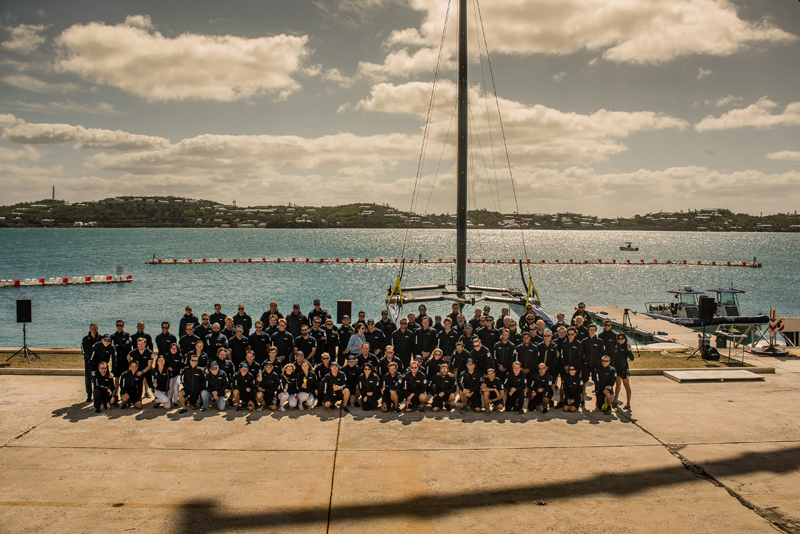 Shane Hoyne, Chief Marketing Officer of Bacardi, commented, “We are incredibly proud to continue our racing heritage into the America’s Cup, supporting Artemis Racing. Bermuda has been our home for more than 50 years and we are all extremely excited ahead of this summer’s action.